Makes a perfect gift to give to anyone. This beautifully crafted pieces of jewelry is sterling silver, and features an 18” rhodium plated chain. 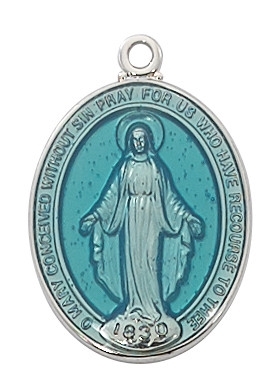 Baroque Style Gold Miraculous Medal Miraculous Medal -- 2.7cm -- Sterling Silver Our Lady of Perpetual Help Sterling Medal Gold Filled Miraculous Pendant, Stainless Gold Heavy Curb Chain, 1" x 5/8"